For members (active & past) only. One vendor table. Does not include seminar attendance or lunch. Member Fees save you $150. Join now! DESCRIPTION: We hear it all the time – “If you see something, say something.” But how do we recognize when we’re in a situation that may be unsafe? How do we keep ourselves and others around us safe? Situational awareness is recognizing and responding to violence and knowing how to stay safe. Jeff Jacobs will use the FBI/Homeland Security protocol called “Run, Hide, Fight” to teach us to be more aware of our situation and to know how to respond to active violence. DESCRIPTION: Motivation is one of the strong components of success, and knowing how to keep yourself inspired is vital to ensuring the health of your career. Learn how to rekindle the spark in how you can deliver the best service possible to your clients, as well as potential clients. Today's new technology is yesterday's news. Staying at the top of your game is vital to your success in the court reporting and captioning arenas. Learn the tips and tricks for staying current with new technology to ensure that the services you provide your clients are supported by the latest in hardware and software products. DESCRIPTION: Marybeth will show you how you can improve your accuracy, increase your speed, and prepare for new certifications in as little as 15 minutes a day! Improve your skills with less editing time, increased income potential, more free time, to name just a few. DESCRIPTION: The speaker will give his point of view on how court reporters should conduct themselves in an ethical and judicial manner in all proceedings. Are you following the Code? DESCRIPTION: How many great new briefs can you learn in 90 minutes? Come and find out as Pam Mayer shares her passion for briefing. Decrease your stroke count and write more efficiently with new ways to eliminate those extra strokes! DESCRIPTION: Test your knowledge of legal and medical terminology, the Arizona Code, and other trivia in the court reporting world! As we discover the answers, we’ll also discuss current questions and issues. The fabulous We-Ko-Pa Resort in Scottsdale/Fountain Hills, Arizona, is the site for our 2017 Annual Convention. 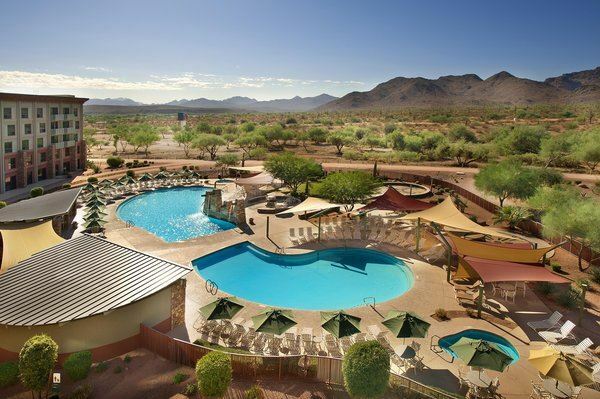 For room reservations at our $99.00 ACRA rate click here or call 480-789-5300. Cut-off date for the ACRA rate is August 15. For more information about the resort, click here. There will be lots of games, raffles, and socializing. Two continental breakfasts, breaks, and lunch will be provided. Court reporting students are welcome to attend this event without charge. By registering, students commit to attend all or a portion of the seminars. When registering, use the code "STUDENT" to access the form. If you would like to contribute to the Student Attendance Fund to defray the cost of these lunches, click here, and thank you! ACRA depends on the financial support of our sponsors to be able to provide quality programming for our events. Please consider being a sponsor. Whether big or small, it is all appreciated. Want to see the several ways you can sponsor this event? Click here. Our raffles provide us with a lot of fun at our events, and they also help to offset some of our expenses so we can provide excellent programs. We would love to know ahead of time what raffle items or cash you can contribute. Want to donate a cash prize or a raffle item? Click here. From keeping up with advancements in technology all the way to finding that perfect set of earrings, our exhibitors and vendors provide us with a wonderful array of goods. To register as an Exhibitor or Vendor, click here. Click here to download a printable form that you can FAX or mail in. Registrations after Sunday, September 10 will include a $30 late fee. Register early!